Gorkha Kingdom (Nepali: गोरखा राज्य) was a kingdom in the confederation of 24 states, known as Chaubisi rajya, located in the Indian subcontinent, present-day western Nepal. The Kingdom of Gorkha extended from the Marshyangdi River in the west to the Trishuli River in the east, which separated it from the kingdoms of Lamjung and Nepal respectively. The Gorkha Kingdom was established by Prince Dravya Shah, second son of King Yasho Brahma Shah of Lamjung Kingdom, on 1559 CE replacing the Khandka chiefs. According to legends, one of the earliest Shah rulers was Rishi-raj Rana-Ji, of the Lunar dynasty. He was made the ruler of Chittorgarh and received the title of Bhattarak. The lunar dynasty remained in power for thirteen generations. Then, the Muslim Yavanas took power. The Bhattarak had to abdicate and could only retain his caste family name, Rana-ji. The rajas were titled Rana-Ji for four generations and Rana-ji Rava for a further seventeen generations. Akbar, the Mughal emperor, (1542-1605) wished to marry the daughter of Fatte Sinha Rana-Ji Rava. Akbar was refused because he was from a different religion (namely Islam) than Hindu religion altogether. This decision led to war. Many Rajput, including Fatte Sinha Rana-ji Rava, were killed. The survivors of the war were led by Udaybam Rana-Ji Rava. They founded a settlement, Udaipur. Manmath Rana-Ji Rava went to Ujjain. His son Bhupal Ranaji Rao went to Ridi in the northern hills and in 1417 AD (Saka 1945), to Sargha, and then to Khium in Bhirkot. There, he cultivated the land. The new ruler of Khium had sons, Kancha and Micha. Their bartabandha (the taking of the Bharmanical thread) was performed. Plans for the boys to marry the daughters of the Raghuvanshi Rajputs were made. Kancha, the elder son went to Dhor. He conquered Mangart and reigned over Garhon, Sathum and Birkot. 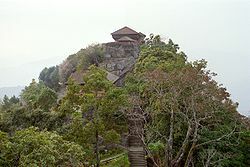 Micha, the younger son, went to Nuwakot in the far west and became ruler there. From Micha, a dynasty of seven rajas commenced in Nuwakot. Kulamandan, the eldest son of Jagdeva, became ruler of Kaski displacing Gurung king. He was favoured and became Shah and succeeded his father. Kalu, the second son was sent to Dura Danda in Lamjung at the people's request to become their king. Kalu was killed by the Sekhant tribe, who were the ancestor of present day Gurungs. In the 1500s, another son, Yasobramha, became the ruler of Lamjung after he compromised with the Gurungs. The second son of Yasobramha, Dravya Shah conquered the Ghale people of neighbouring Ligligkot, now in Gorkha. Prince Dravya Shah on 1559 CE also replaced the Khandka chiefs to become the first King of Gorkha Kingdom. The ancient name of Gor-kha is White Zhou or Shakya. From 1736, the Gorkhalis engaged in a campaign of expansion begun by King Nara Bhupal Shah, which was continued by his son, King Prithvi Narayan Shah and grandson Prince Bahadur Shah. Over the years, they conquered huge tracts of land to the east and west of Gorkha. Among their conquests, the most important and valuable acquisition was the wealthy Newar confederacy of Nepal Mandala centered in the Kathmandu Valley. Starting in 1745, the Gorkhalis mounted a blockade in a bid to starve the population into submission, but the inhabitants held out. The Newars appealed to the British East India Company to help, and in 1767, it sent an expedition under Captain Kinloch which ended in failure. The three Newar capitals of Kathmandu, Lalitpur and Bhaktapur fell to the Gorkhalis between 1768 and 1769. The Gorkhali king subsequently moved his capital to Kathmandu. In 1788, the Gorkhalis turned their attention north and invaded Tibet. They seized the border towns of Kyirong and Kuti, and forced the Tibetans to pay an annual tribute. When the Tibetans stopped paying it, the Gorkhalis invaded Tibet again in 1791 and plundered the Tashilhunpo Monastery in Shigatse. This time the Chinese army came to Tibet's defence and advanced close to Kathmandu but couldn't achieve success due to strong counterattack with Khukuri. The anxious Bahadur Shah asked for 10 howitzer mountain guns from the British East India Company. Captain William Kirkpatrick arrived in Kathmandu. Eventually, the Fu Kanggan was keen to protect his army and war being resultless was concluded by signing a peace treaty at Betrawati. The Gorkha dominion reached its height at the beginning of the 19th century, extending all along the Himalayan foothills from Kumaon and Garhwal in the west to Sikkim in the east. They were made to return much of the occupied territories after their defeat in the Anglo-Nepalese War (1814–1816) later during the gorkha Sikh war (1809) they lost the control over kangra valley. The Gorkha dominion continued to be known as Gorkha Rajya (meaning the Gorkha Kingdom) until the beginning of the 20th century. Historically, the name 'Nepal' referred mainly to Kathmandu valley, the homeland of the Newars. Since the 1930s, the state began using it to refer to the entire country and 'Nepal Khaldo' (Nepal Valley) became 'Kathmandu Valley'. The name Gorkha Sarkar (meaning Gorkha government) was also changed to Nepal government. Similarly, the Gorkhali language was renamed as Nepali in 1933. The term Gorkhali in the former national anthem entitled "Shreeman Gambhir" was changed to Nepali in 1951. The government newspaper, launched in 1901, is still known as Gorkhapatra (meaning Gorkha gazette). The Shah dynasty ruled Nepal until 2008 when it became a republic following a people's movement. Today, Gorkha District, roughly corresponding to the old kingdom, is one of the 77 administrative districts of Nepal. Not to be confused with the inhabitants of the old Gorkha Kingdom only, the Gurkhas are also military units in the British or the Indian army (where they are known as Gorkhas) enlisted in Nepal and India. Their history goes back to the Anglo-Gorkha War and the Sugauli Treaty of 1816. It allowed the British East India Company to recruit men from the Gorkha kingdom hills to serve as soldiers under contract. 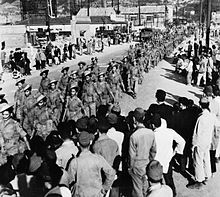 During World War II (1939–45), a total of 250,280 Gurkhas served in 40 battalions, plus eight Nepalese Army battalions, plus parachute, training, garrison, and porter units. They earned 2,734 bravery awards, and suffered around 32,000 casualties in all theatres. ^ Hamilton, Francis Buchanan (1819). An Account of the Kingdom Of Nepal and of the Territories Annexed to This Dominion by the House of Gorkha. Edinburgh: Longman. Retrieved 12 January 2013. Page 237. ^ Kirkpatrick, Colonel (1811). An Account of the Kingdom of Nepaul. London: William Miller. Retrieved 12 January 2013. Page 123. ^ a b c d "Nepal2". www.royalark.net. ^ "Bringing Aid To Gorkha's Poor | Features | ECS Nepal - The Nepali Way". ecs.com.np. ^ Hamilton, Francis Buchanan (1819). An Account of the Kingdom Of Nepal and of the Territories Annexed to This Dominion by the House of Gorkha. Edinburgh: Longman. Retrieved 6 January 2013. Page 7. ^ Northey, William Brook and Morris, Charles John (1928). The Gurkhas: Nepal-Their Manners, Customs and Country. Asian Educational Services. ISBN 9788120615779. Pages 30-31. ^ Marshall, Julie G. (2005). "Gurkha Conquest of Nepal and the Kinloch and Logan Missions". Britain And Tibet 1765-1947. Routledge. p. 39. ISBN 9780415336475. ^ Hamilton, Francis Buchanan (1819). An Account of the Kingdom Of Nepal and of the Territories Annexed to This Dominion by the House of Gorkha. Edinburgh: Longman. Retrieved 15 January 2013. Page 7. ^ Marshall, Julie G. (2005). "Nepal 1788-1903". Britain And Tibet 1765-1947. Routledge. p. 57. ISBN 9780415336475. ^ Kirkpatrick, Colonel (1811). An Account of the Kingdom of Nepaul. London: William Miller. Retrieved 11 February 2013. ^ Boulnois, L. "Chinese Maps and Prints on the Tibet-Gorkha War of 1788-92" (PDF). Kailash. p. 86. Retrieved 21 January 2013. ^ "The Enclosing of Nepal". U.S. Library of Congress. Retrieved 21 January 2013. ^ Pradhan, Kumar (1991). The Gorkha conquests: the process and consequences of the unification of Nepal, with particular reference to eastern Nepal. Oxford University Press. Retrieved 6 February 2013. ^ Jha, Pranab Kumar (1985). History of Sikkim, 1817-1904: Analysis of British Policy and Activities. O.P.S. Publishers. p. 11. ASIN B001OQE7EY. ^ Planet, Lonely. "History of Nepal - Lonely Planet Travel Information". www.lonelyplanet.com. Retrieved 2016-05-08. ^ Bindloss, Joseph (2010-09-15). Nepal 8. Lonely Planet. ISBN 9781742203614. ^ Lienhard, Siegfried (1992). Songs of Nepal: An Anthology of Nevar Folksongs and Hymns. New Delhi: Motilal Banarsidas. ISBN 81-208-0963-7. Page 3. ^ "The kings song". Himal Southasian. June 2003. Archived from the original on 25 October 2012. Retrieved 3 April 2012. ^ "Nepal's Gorkha kingdom falls". The Times of India. 2 June 2008. Retrieved 11 February 2013. ^ Parker, John (2005). The Gurkhas: The Inside Story of the World's Most Feared Soldiers. Headline Book Publishing. ISBN 978-0-7553-1415-7.